A number of the Somali areas that enjoy relative peace and stability have established functioning governance structures and favorable business environments that have facilitated investment in sectors including livestock, import and export, telecommunications, remittances, and more. These areas are now ripe for support to private sector development, investment, and economic policy development. The USAID Partnership for Economic Growth program works with local authorities and private sector groups to improve the enabling environment for investment and generate more productive employment and incomes. Support the Ministry of Livestock to improve the animal health and animal feed sub-sectors. The animal health activity will strengthen community-based animal health service delivery and improve quality veterinary drug supply. The program also works with local institutions and agribusinesses to strengthen the production and marketing of livestock feed. Partner with Amoud University and local agribusinesses, work with farmers to increase production and farmer incomes by establishing irrigated demonstration plots to select the best performing vegetable crop varieties. Best performing varieties will be selected and multiplied for uptake by farmers. Provide training in marketing and business skills to farmers, traders, and vendors. Work with the Ministry of Mining, Energy, and Water Resources to help create Somaliland’s first legal and regulatory framework to govern energy/electricity production and distribution, and reduce costs for consumers and businesses. The program will also pilot alternative energy sources (particularly wind) through support to investment. Support the Ministry of Commerce’s nascent Investment Climate Unit and the Somaliland Chamber of Commerce to promote investment by developing a Somaliland Business Confidence Index (SBCI) and the first Somaliland Investment Guide. 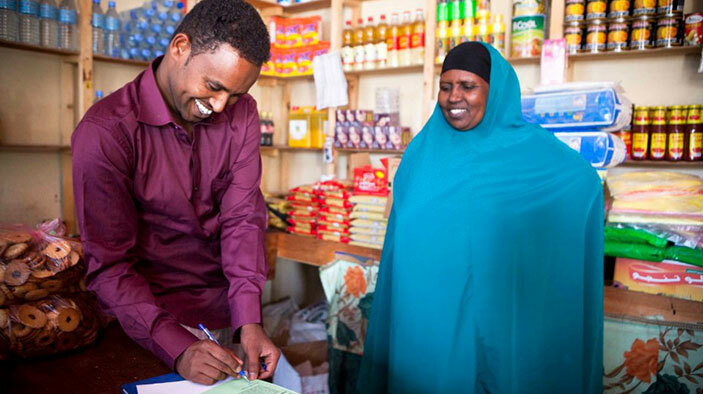 Launch an innovative business grant fund that will co-fund Somali businesses, nonprofits, and institutions to forge partnerships and share risk in private sector ventures, with awards ranging from $10,000 to $100,000. Conducted Somaliland’s first business-plan competition; invested more than $1 million in matching grants for the winning small and medium enterprises, which represent promising sectors such as agriculture, livestock, fisheries, and renewable energy. Created more than 1,500 new or better jobs through these investments, including in Somaliland’s first salt processing plant, first two wind farms, first major drip-irrigation system for livestock fattening farms, and two fish processing and cold storage facilities. Developed Somaliland’s first agriculture extension unit since the civil war; participating farmers saw yields increase by 100-500 percent, while production costs decreased due to improved practices, making the farmers more competitive with Ethiopian imports. Helped develop Somaliland’s first Electrical Energy Law, which is expected to benefit more than 2 million power-users in the major cities. Developed and implemented community-based animal health training and curriculum, benefiting an estimated 80,000 people who can now access better- trained veterinary pharmacists and extension workers. Through support to the Ministry of Commerce, developed more streamlined investment laws, an investment guide, and www.SomalilandInvest.net, which is expected to benefit 2,000 registered businesses.